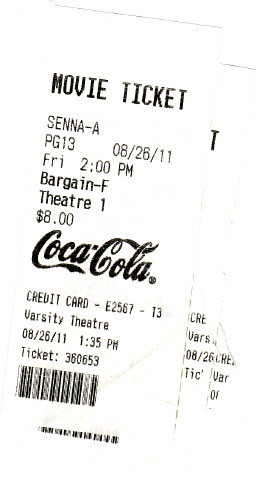 No Fenders -Formula 1, IndyCar and A Whole lot more..: SENNA: A Truly Great Movie! So first of all, I’ll say I’ve been extremely excited about seeing this movie for quite some time now, being my first movie I’ve gone to in 19-months - and thus, I’m very biased in favour of the movie... As I found it to be extremely well done, fascinating and very powerful, with its edginess towards Ayrton’s continuous battle of racing vs. the dangerous perils inherent with the sport. As I’ve seen our current President on his “Book Tour” at Benaroya Hall before declaring his candicy, along with having been privileged to meet Dan Gurney, Phil Hill, Parnelli Jones and Carroll Shelby to name just a few... Not to mention the good fortune of witnessing some of Formula 1’s Aristocracy In action; having seen Ayrton Senna, Alain Prost, Nigel Mansell and Nelson Piquet compete at Phoenix, Arizona. Not to mention someone I’ve taken to calling DER TERMINATOR, nee Michael Schumacher at home and abroad; as I simply bring this up to try somehow spotlighting just how Gynormous of an individual personality the late ‘Ay-airton was! And whilst merely mentioning the various personalities above as reference - as the year’s flow by, I’m more ‘N more amazed that I could have reached out and touched this National Hero 22yrs ago which I chronicled in; May Day. And I’ve also had the privilege of being in Der Fatherland during Herr Schumacher’s ‘IMMER FERRARI REIGN. But every time I hear the Brazilians chanting & singing in such high praise to Senna during his Home race - it simply makes the hairs on my backside immediately stand UP! As NOBODY compares to la Brasilia! And I’ll not try repeating what all of the movie reviews have said - other then that the film does a masterful job of highlighting Senna’s Formula One career from 1984 to 1994; beginning with his debutant Toleman season, an extremely quick Lotus recap before focusing upon the main thrust of the McLaren and Williams era and his battles with Arch-nemesis Prost. And yet while the documentary seems to try doing its best to portray Prost as the Bad Man - almost evil and certainly the Black knight of the two, with naturally Senna being the good, nee White knight of these opposing forces. And while I’ve prattled on a la Professor (Steve) Matchett style over DER TERMINATOR’S mythical runner-up finish to Damon (‘Damion) Hill whilst his Benetton-Ford was stuck in 5th gear, I’d completely forgotten Ayrton’s HERCULIAN efforts to finish off the ’91 Brazilian Grand Prix with his McLaren-Honda’s Gearbox unexpectedly acting up towards the end of the race - after a Gearbox failure had caught BLOODY ‘NIGE (Mansell_ out whilst trying to chase down Senna in P2 some half minute behind. As Ayrton decided to simply leave his McLaren’s ‘Crashbox solely in 6th gear for the races final seven laps! To which Senna exuded so much effort that Mi Madre pointed out how it hurt to just have anybody touch him... Not to mention how Senna could barely lift the winner’s trophy aloft overhead! 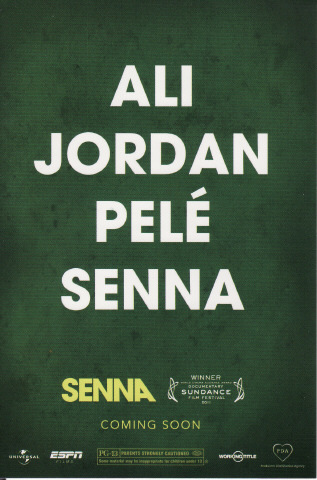 As Senna and McLaren’s protests were to NO avail, which Senna took to announcing as French favourtism - which ostensibly, the year prior after the very same race had garnered the Brazilian a six-month suspension of his mandatory FIA Driver’s Superlicense and a ‘Mega $100,000 fine to boot for speaking out so unfavorably towards Messer Balestre! 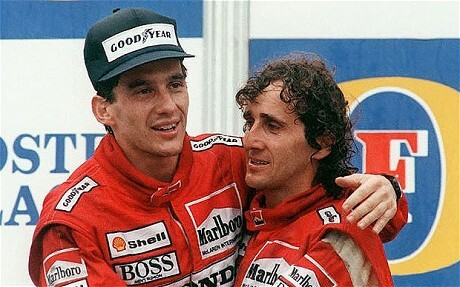 Meanwhile, on race day, for the second year in-a-row the two rival titlist’s collided as Senna repaid the favour of the year prior to Prost in order to secure his second Driver’s crown. As it was somewhat eerie to hear Bob Varsha and David Hobbs calling the Suzuka crash of 1989 in the movie, albeit the broadcast duo were then actually on-scene and calling the race for the ‘Deuce (ESPN2) I believe, as I know I watched that race in the middle of the night some two-plus decades ago; Aye Karumba! As I’d forgotten how the Driver’s title came down to the Japanese GP’s outcome four years in-a-row: 1988-89-90-91. And it was even funnier how it took me approximately half of the movie to figure out who the main narrator’s voice was? Oh, it’s the ‘BIZ, as in the somewhat lamented John Bisignano... CRIKEYS! I’d totally washed him right outta my head! There’s also a very emotional moment when Mi Madre asks; did he DIE! When the camera’s focus upon Martin Donnelly’s HORRIFIC SHUNT! Which if I try hard enough I can still see the Camel yellow Lotus disintegrating into a MILLION pieces with the Irishman lying in the middle of the track in just his cockpit cell! "I cried a lot the day that he died," said Kanaan, who was at the Imola track that weekend. "I went to his funeral, and I didn't even go to my dad's funeral. It's the only funeral I've ever been to." While lastly, I’ll use Michael’s word’s to describe another poignant moment of the film, when in closing Ayrton is asked who his fiercest competitor was - to which he gives a totally unexpected answer. And while the film is wonderful and rightly shows the human side of Senna, keep in mind that much of the movie’s ‘Kodachrome is provided by the Senna family, thus obviously wishing to show Ayrton in his best light. As there’s NO mention of just a few of the Political games the Brazilian played himself, i.e. ; running not one, but two teammates out of Lotus after he’d bolted from Toleman and was ‘Sat-down for one race outing for having broken his contract. As the late Elio de Angelis became so soured over what he deemed preferential treatment towards Ayrton during his first season at Lotus that the Italian left for Brabham at the end of ’85.